Ok, we all know I have a small problem with putting stickers on my car. Well now it has been taken to a whole new level. Let's go back. Yesterday I had 2 ballgames starting at the same time to get to. I stayed late at game 1 and then drove to game 2 and got to it about half time. But on my drive there apparently there was a beacon of light (headlights maybe?) drawing the bugs to my car. I didn't realize it was happening at the time. By the time I got home last night it was late and I couldn't see my front bumper. So this morning I got to get up and run....WOO HOO!!!! This is the first time I have gotten to run all week long. I had to squeeze in the run between sleep and a hair appointment and I also wanted to eat breakfast with my running buddy, so we ran a few, ate breakfast, and then ran back to the gym. I got back just in time to get to my hair appointment. So got my hairs cut, a much needed cut I might add, and then off to another appointment. I was booked all day long, back to back, basically all my appointments overlapped by about 5 minutes but luckily my 10:00am appt went quick and I had an extra 20 minutes and at this point I was well aware of the bug situation on the front bumper of my car. So I headed to the car wash. When I pulled into the car wash I walked around the car and much to my surprise there are 2 new stickers on the back of my car. Now not only do I have a problem with the stickers but other people are now sticking them to my car. I think I know who the culprit is but I have not proven it yet. Thank goodness they are magnets and not stickers. 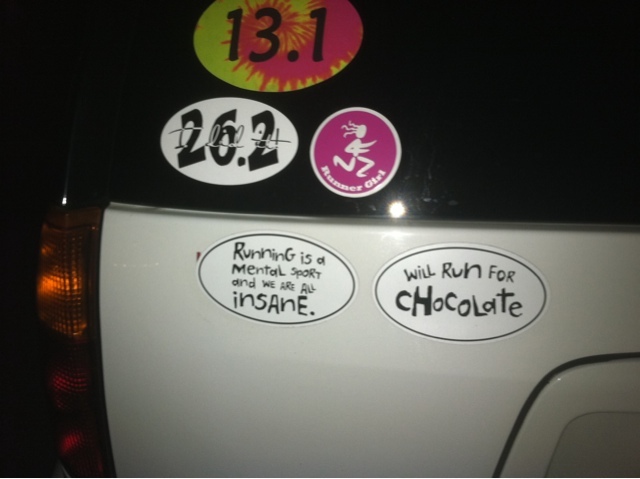 I would have been really upset if someone had stuck stickers to my car. I have had another busy week this week but nothing like last week. I have run so crazy this week that about ever day I have to stop and put gas in my car but I don't have enough time to fill it up so I have gotten $20 here and $15 there. But this week is the last week of Volleyball and Middle School Football so maybe things will slow down a bit. I say that now but once they slow down I get bored and will be chomping at the bit for a new sport of event to support. Next week is shaping up to be a more relaxed week and I cannot wait. I'm really excited about a little bit of time off. Oh oh oh, and on Wednesday night I got to watch Biggest Loser. I have seen both episodes so far but I haven't gotten to watch either of them when they came on. This week it was well past mid-night when I finally tuned in. I watched the show as I folded 2 weeks worth of laundry. Who knew all that time I was wasting between 10pm and 5am sleeping could be so productive?? I am already liking this season of Biggest Loser. I like that it is not couples. They have done too many of those in a row. And I like the breakdown of ages. They have done the men and women and teams but this is a cool new twist. I'm still trying to pick a favorite....as of right now I think Vinny is my guy and the girl I just don't know yet. Becky moved to a high spot in my book on week one but I don't think she is my pick for the girl just yet. (I know when my mom died the last thing I wanted to do was workout, I just wanted to lay down in my bed and sleep. The fact that she got right back into the game was impressive.) The old team is getting picked off one by one right now so they may not be in the game much longer. I am hoping this week I will get to watch it when it comes on but I have it recording just in case I miss it. I will be out of commission next week for the beginning of the week but hope to post at some point. It may be Thursday before I get back on here. Update: Well she admitted it. 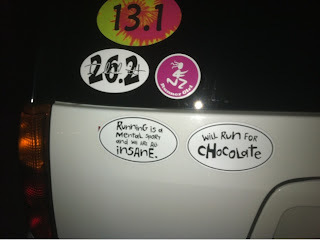 I now know that at some point this morning, my running buddy stuck them to my car. I don't really know how she did it, we were together the whole time! She said they were on there when we finished our run and I never saw it.